We know it. That moment when you’ve covered the huge meadow’s margins for several hours, searching for butterflies, out of the ordinary butterflies. 100 acres plus or minus in Doak Field last Raccoon Creek State Park, just miles from Pennsylvania’s state line with West Virginia. Great Spangled Fritillaries bounce in the air from one side of the cut-trail to the other, wood nymphs also cross the mowed trail, they hugging the ground, but no less difficult to follow and shoot. Eastern Tiger Swallowtail males fly that crazy, frenetic way they do, searching for receptive females.Silver Spotted Skippers flee their place at the nectar bar on your approach. A Monarch butterfly or two dreamily floats from one Common Milkweed (Asclepias syriaca) to the next. Red-Spotted Purples deny you a click of the camera, vacating their perch when you close the gap with them (and shucks! didn’t that one sport really fine red spots). So I’m working the forest side of the mowed trail, along the southern perimeter of Doak field . . . and my eyes, sporting thousands of hours of field work experience, register a curious geometry. I see a tiny triangular shape, resting on a leaf blade. Eureka!! My brain makes the ID in nanoseconds, a Hairstreak. Now hairstreaks are usually few and far between, be they Grays, Red-bandeds, the hard to find Stripeds, the calendar-shy Corals ( with their 2-week or so flights ) or the rarest of rare White-M’s. Huh? What! Are you sure?? It none of the above. Battlestations! (That’s how I think ). Can it be??? 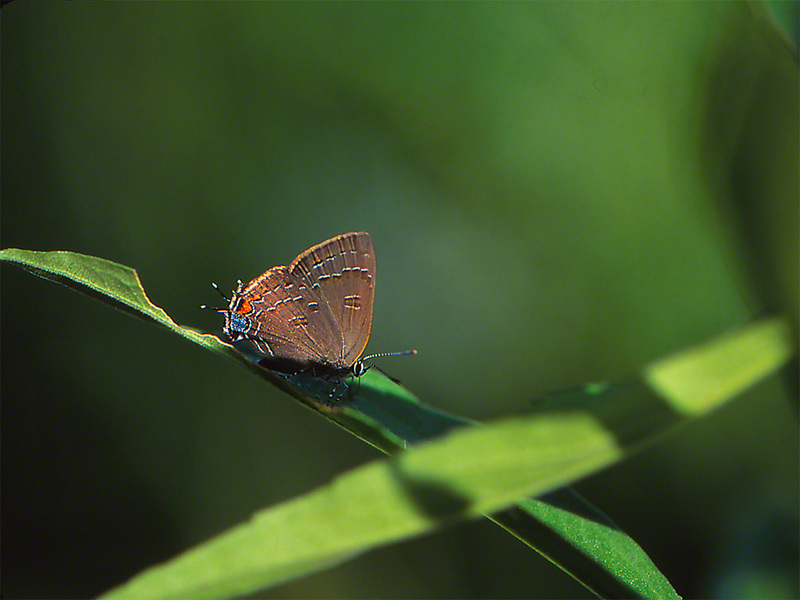 A Banded Hairstreak. A Banded Hairstreak?? That blue on the hindwing extends way out from the orange spots, as Bandeds’ blue patch does. There is one other possibility, that it’s the very similar Hickory Hairstreak. We conclude that this sweetie is a Banded Hairstreak, and that is Good, Very Good. Fun for Jeff, in the field. Who among you can claim such excitement in the field?